Auriculo 3D – The World’s Most Powerful Auriculotherapy Software! Whether you’re looking for rapid pain relief, addiction recovery, stress management or health improvement, auriculotherapy has achieved results for thousands of years—often more quickly and powerfully than any other treatment. Also known as auriculo acupuncture, auriculotherapy focuses on correcting underlying energy imbalances to get rapid results. Properly administered, auriculotherapy often provides faster results than any other treatment. 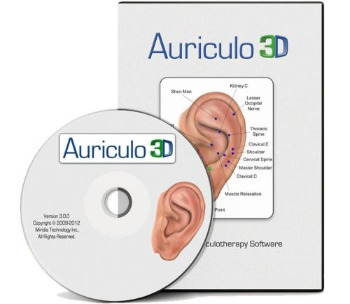 Auriculo 3D desktop software helps you master this powerful therapy—without paging through dozens of books or consulting confusing charts. There are over 300 recognized auriculotherapy points on the ear, and thousands of combinations to treat nearly any problem imaginable. Designed for both clinical use and personal study, Auriculo 3D puts all this information at your fingertips with the click of a mouse.